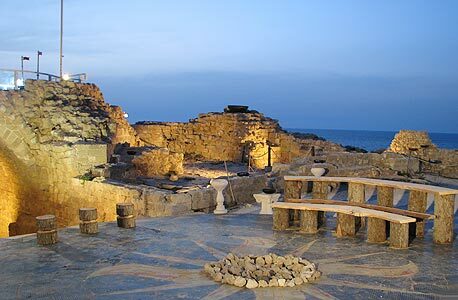 Arsuf , also known as Arsur or Apollonia(Ancient Greek Απολλωνία), was an ancient city and fortress located in Israel, about 15 kilometres north of modern Tel Aviv, on a cliff above the Mediterranean Sea. The town was settled by Phoenicians in the 6th or 5th century BC, and named Reshef after Resheph, the Canaanite god of fertility and the underworld. It was then a part of the Persian Empire and governed from Sidon. Phoenicians of Reshef produced precious purple dye, derived from murex mollusks, which they exported to the Aegean. During the Hellenistic period it was an anchorage town, ruled by Seleucids and renamed Apollonia, as the Greeks identified Phoenician God Reshef with Apollo. Under Roman rule, the size of the town increased. 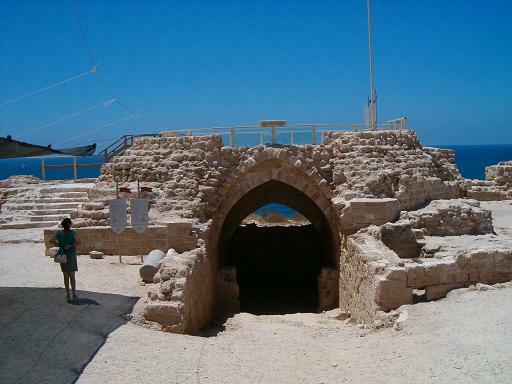 It was an important settlement between Jaffa and Caesarea along Via Maris, the coastal road. In 113 AD, Apollonia was destroyed partially by an earthquake, but recovered quickly. The harbor was built, and trade with Italy and North Africa developed. In 1101, Arsuf fell to a Crusader army led by Baldwin I of Jerusalem. The Crusaders, who called it Arsur, rebuilt the city’s walls and created the Lordship of Arsur in the Kingdom of Jerusalem. In 1187 Arsuf was captured by the Muslims, but fell again to the Crusaders on September 7, 1191 after a battle between Richard I of England and Saladin. John of Ibelin, Lord of Beirut (1177—1236) became Lord of Arsuf in 1207 when he married Melisende of Arsuf (born c.1170). Their son John of Arsuf (c.1211—1258) inherited the title. The title then passed to John of Arsuf’s eldest son Balian of Arsuf (1239—1277). He built new walls, the big fortress and new harbor (1241). From 1261, the city was ruled by the Knights Hospitaller. In 1265, sultan Baibars, ruler of the Mamluks, captured Arsur, after 40 days of siege. The Mamluks razed the city walls and the fortress to their foundations, fearing a return of the Crusaders. The destruction was so complete that the site was abandoned. Tagged apollonia, Center, coastline, herzeliya.